Hey everyone. I'm making the magic happen right now. Come warm yourself with the HOTTEST Auburn blog on the 'net. HIGHLIGHT POINT: "It remains to be seen whether Tuberville is seriously interested in the job -- which seems like a lateral move, at best -- or is simply using it as leverage to land his own Nick Saban-like contract at Auburn." HIGHLIGHT POINT: "But speculation for weeks has strong mutual interest existing between Auburn coach Tommy Tuberville and Texas A&M." HIGHLIGHT POINT: Barely mentions Tuberville. It's a pretty frenzied environment here in the (fully loaded) press box. As you'd expect, there's a lot of chatter about Tuberville's next move. He'll meet with school administrators on Sunday or Monday to have The Talk. I'm looking for athletic director Jay Jacobs right now to see if any schools have inquired. He also may provide some scheduling insight. Hey everyone. After a 107-day streak of daily blogs, I took a few days off from the heat. My parents made the trip to Montgomery, I don't see them very often at all and, well, I make the rule around here. So we here at the HABOTN hope you had a swell Thanksgiving full of delicious goodness. I'll be in and out today with periodic updates. I received a letter from WNSP program director Tim Camp, the guy who fired Neal McCready, and I'll share some of that message with you. I know that story only appeals to a percentage of you all, but I'm in that percentage and the tale keeps getting funnier. 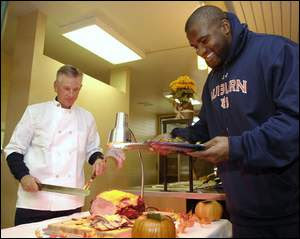 How do you like that picture of Tommy Tuberville carving ham for Leon Hart? That is a shot years in the making, I tell ya. We know you're stuffed, but thanks for for rolling by for another fill of the HOTTEST Auburn blog on the 'net. I'm not a Mississippi State http://www.blogger.com/img/gl.link.giffan by any stretch, but I was really glad to see Sly Croom get his seventh win today. The HABOTN headquarters had the Egg Bowl tuned in and I'll admit to being pretty geeked to see the Bulldogs win. I really like Croom. He's a good dude, a good coach and someone who definitely keeps it real. I don't run a lot comparatively speaking -- I prefer the arc trainer and Precor machines -- but I liked the playlist Jeff Pearlman of ESPN.com posted the other day. There is good workout music in his list and in the lists readers have provided in the comments rection. Here is a portion of the letter I received on Wednesday from Tim Camp. Note that he spells Neal McCready's name incorrectly throughout. ``Perhaps if what Neil has said about the reason for his termination at WNSP were true, I could somewhat understand your actions. His comments make a nice story however history does not bear him out. WNSP has been operated by the same management for thirteen years and our editorial position of open and honest debate has not suddenly changed. We had Neil on the air for five years! During that time I received complaints from listeners and advertisers from the first week he was on the air until the last. If his reporting had been a issue I would have terminated him long ago. The thing that most disturbs me however is the fact that you sight some journalistic integrity as your reason for not coming on the station. If it is journalistic integrity then why would you make a decision based on only one side of the story. Would your editors allow you to publish a controversial story with only one angry source? Not one of the "journahttp://www.blogger.com/img/gl.link.giflists" who have consumed the kool aid that Neil is serving has called me or contacted me to find out our reasons for letting Neil go and the reporters who have contacted me have printed partial statements placed out of context. Neil can be a great sports radio talent, however after five years of his attitude of the glass always being half empty we begin to realize that it was having a negative effect on our staff, our operation, and our business. Neil had contempt for the listeners, the subject matter that he had to report on, and the city which we call home. I had simply had enough and decided that maybe we would be better off finding someone who could see the glass half full at least some of the time." I've said my peace on this subject. I thought it was fair to let Mr. Camp tell his side of the story, though ragging the Press-Register's story for using information "out of context" was too delicious to not pass along. Hey everyone. I've got a suprise for you today. Gordon Borges got back with me and said he didn't mind if I posted the email I referenced last week. I thought it was exceedingly cool for Gordon to take time to basically get his son's back in what have become some tough times. It's clear to everyone involved that Al Borges may or may not be here next season. The offense isn't exactly thriving and Kodi Burns' play didn't really provide the 2008 affirmation a lot of people expected. It's pretty neat that even in this age of coach-as-celebrity that a father would still take the time to get his son's back. You can find that below. I've also got something to say about Tuberville's alleged commentary about being at Auburn next year. I wouldn't read too much into that statement. I'm not saying he's leaving. I'm just saying that what Tuberville said is not the same as I'll be here next season. With emails this smokin', you know it's the HOTTEST Auburn blog on the 'net. 22 years. 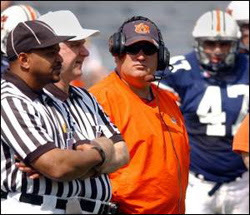 During that time Al has been associated with five 1A Head coaches. It's my opinion that Tuberville is without question the best of the lot, and this includes the Guru at the University of Oregon. In my judgment the Auburn fans & school administration should give Tuberville their unqualified support. It should be remembered that his enviable record over the last 4 years reads 40 & 8 to date!! Forgive my bias but part of that amazing ACCOMPLISHMENT has been the offensive prowess of Al Borges. 13 & 0 in 2004 tells it best. We have a good team now but not a great one..
2008 will be something different. As far as Tuberville's Monday comments about his situation at Auburn, I cannot believe how far this has gone. I'm at the gym this morning and I see something about how "Tuberville plans to stay at Auburn" moving along the CNN crawl? Tuberville on CNN? Talk about a slow news day. 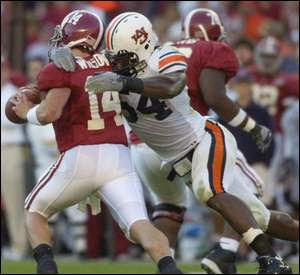 Here's the quote: ``I love Auburn. I love the Auburn people," Tuberville said. ``They've done a lot for me and I hope we've done a lot for them. We're going to be at Auburn as long as they want us here. We're fired up about that." I'll go into more detail about this in my weekly "First and 10" column that runs Saturday morning. Until then, ponder what he's actually saying. He'll be at Auburn as long as Auburn wants him. That is his strongest statement to date about possibly leaving the program someday soon. There's no doubt about that. Still, that is not an air-tight statement. No way. Look, I currently consider it likely that Tuberville will be Auburn's coach next season. I'm not saying he's leaving. I'm saying that a decision hasn't been reached on that. His statement on Monday, at least in my mind, was mostly damage control after what was an odd decision last week to completely avoid the subject. This is a rare break from protocol, but I wanted to post part of an email I received today from a guy named Hank. Most HABOTN readers send me nice emails full of rainbows and butterflies. Those are swell. I do like the occasional dig, though, and this email gets consideration for the HABOTN Hall of Fame. ``You stated that your good buddy Neal McCready was not biased that he loathed everyone equally. Is this your position as well? I expect a beat writer to at least be a sports fan. I don’t want a cheerleader like half the Alabama sportswriters. I think that what happened to Neal was wrong but he set himself up for the fall. He wanted to be controversial like Finebaum. I have listened to him spew the same hate for Tuberville that you do. If you need someone to use as an example of what a beat writer is look at Philip Marshall. He doesn’t create controversy he reports the news. He states his opinion. One that is based on what he sees from following the teams he covers. If you decide in the future to resort to professional journalism rent a banner or take out an ad and let someone know. Until then I am sure I can find decent coverage of Auburn sports without wasting my time with the crap you continue to put out." At least I got Phillip's name in the blog again. Weeeee. Hey everybody. It's Tuesday, uh, Monday with Tuberville. Auburn moved its weekly press conference to Monday this week for some reason. I don't know why. I don't care. Alls I know is this allows me to get an early start on Iron Bowl stories. And in the end, you know, it's all about me. My guess is that this is a Red Elephant Club-free zone. Either way, it's the HOTTEST Auburn blog on the 'net. Tuberville said a lot of gobbly-gook (and a few interesting things) at his weekly presser today. Because of the various literary enterprises I'm being asked to produce for our fine newspaper product, I'm not going to give you the blow-by-blow account I usually provide. On his future ... ``I love Auburn. 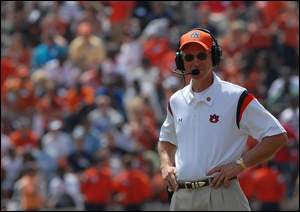 I love the Auburn people," Tuberville said. ``They've done a lot for me and I hope we've done a lot for them. We're going to be at Auburn as long as they want us here. We're fired up about that." Hey everyone. It's that time of year again when people get crazy and start believing one game means everything. I, Jay G., pledge to not get carried away with similar kinds of rhetoric this week. I'll write only one story about The Streak, one story about what this game means to the players. Aside from that, I'll just keep it real like you know I do. We don't cave to special interests here. This is the HOTTEST Auburn blog on the 'net. New carpet was installed along the coaches' corridor inside the Athletic Complex on Sunday morning, combining with some recent paint work to make the place look a tad more plush. I had to laugh when I first spotted the carpet today. Coach Tommy Tuberville is seeking significant upgrades to the complex and, whaddyaknow, here's some new carpet 10 days before Tuberville meets with school officials. Coincidence? That's no fun. One of Tuberville's complaints about moving the Iron Bowl back a week (we're running a front-page story on this issue Wednesday) is that the rivalry gets lost in the national shuffle. Anecdotal evidence suggests he's correct. There was one caller on Tuberville's weekly teleconference today: Atlanta Journal-Constitution ace Tony Barnhart. That's the lowest turnout of the season. I found that interesting. Are you wondering why I wasn't on the teleconference? I was there in person -- with all the other beat peeps.